This product allows you to convert your bike specific Baja Designs LED to our highly adjustable bracket. Includes parts to make the conversion. Compatible with 2017+ Husqvarna with the OEM headlight shroud. Topo lines or blank face plate pattern (choose above). 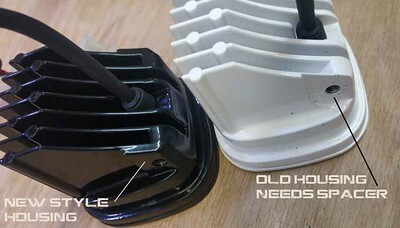 Old or New style LED housing compatible (choose above). See picture below to tell the difference. Works with the Baja Designs Squadron Sport and Pro LEDs. LED light NOT included with this product. A 3D Printed, Polycarbonate bracket = lightweight and super rugged. WE NEED TO KNOW IF YOU HAVE THE OLD OR NEW STYLE SQUADRON HOUSING. The new housing is wider than the old housing at the mounting point. If you are not sure, shoot us an email before you order. 1x Billet Standard size face plate. 1x Set of mounting hardware.